And, no, we are not talking about complaining here. "Carping" is often used as synonym for complaining. But to an angler, in particular, a fisherman from Great Britain, the word denotes someone who is dedicated--no, devoted--to the fine art of seeking and catching what some Americans foolishly call "Trash Fish". Carp! You see, more people fish for carp in the world than for any other species. But here in America, anglers are not too anxious to seek out this commonly found critter! 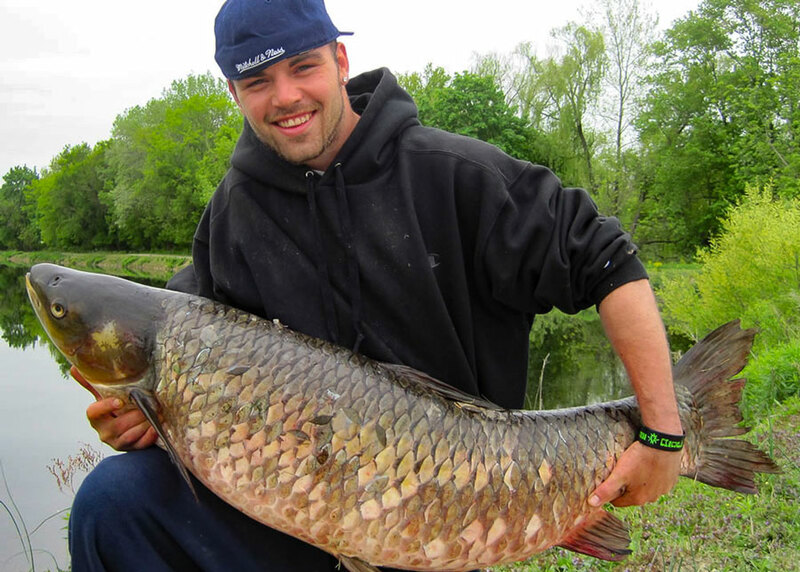 A Grass Carp caught by James Dempsey, Jr of Ewing New Jersey on May 12, 2011 is the state record. The huge fish was taken from Curlis Lake in Mercer County and weighed an astounding 55 lbs. 8 oz. 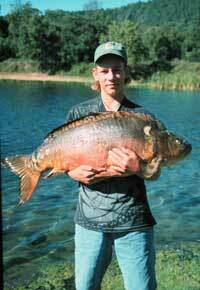 When I was researching my book, "Gone Fishin' For Carp" in 1995, I ran across at least five or six publications in England, which featured carp fishing. Several dealt only with carp fishing, and one was actually called "Carp World". Its editor, Tim Paisley, told me that he sold 15,000 copies each month of the fine magazine. In fact, his photo appears alongside of mine on the cover of my book. He is holding a "mirror" carp, a member of the carp family that has no scales at all. While I have never seen such a carp, I intend to catch one someday, even if I have to go back to England to do it. I wrote an article for Tim's magazine about carp fishing here in New Jersey, and was then hired to write a similar feature for a German carp fishing magazine. fishing the South Branch of the Raritan River in 1995. It scaled an impressive 47 pounds. Here in America we can pull up to a hunk of water and start fishing. Most bodies of water in New Jersey are freely accessible, save the cost of a fishing license. Well, in England, the opposite applies. Most of the guys who seek carp (Carpers) have to buy the right to fish a private body of water. Some join clubs to fish in their exclusive pond, and others pay a fee to the owner of the lake, but rarely can they enjoy what we have here. The thing is, most New Jersey anglers don't ever go after the strongest and heaviest and smartest of all fish found in American freshwater! You can always spot a British carp specialist. They carry equipment that is so different from what we use that it boggles the mind. Start with the rod. It is generally 10-12 feet long, not six or seven like we use. Similar in length to a steelhead rod, but twice as thick, it's intent is to get a bait out far and have lots of backbone to fight a fish into submission. The reel is a spinning model, usually a "Bait-runner", one that allows a closed bale to release line to a running fish with such ease that the fish doesn't know that someone is at the other end waiting to stick a hook into its mouth. They use the same kind of line as we do, but normally, at heavier breaking strength than a New Jersey freshwater fisherman will use. And they use some unusual rigs. One called a "Hair-rig" allows a thin length of material, once a hair but now a piece of thread, to be tied to the hook shank. Onto the thread is placed a "boilee" or several kernels of maize (hard corn) as bait. The hook itself has no bait! Cast out, a passing carp will inhale the baited "hair" and wind up also taking the hook into its mouth. English anglers swear that they get more bites from big carp on this rig than if they baited the hook itself. "Carpers" also are credited with creating what they call "Pop-Up" fishing, allowing an angler to bait a hook and still allow the fish to see the food up off bottom. Use a standard half-ounce or heavier egg sinker, and put a small pinch-on sinker on next, allowing a foot or so of line to remain. Tie on a size six bait-holder hook and you are set. Put a yellow miniature marshmallow or piece of yellow Styrofoam on up at the eye of the hook and then add three or four kernels of corn. Cast out, the sinker will go to bottom, and the hook will rise up a foot allowing the bait to be clearly in view. Here in New Jersey, we have countless lakes, rivers, ponds and streams that hold carp. In Northwest New Jersey, I can personally attest to the fact that the following bodies of water have lots of carp in them: The Delaware River (The Pennsylvania State Record carp came from there), the Wallkill River, Paulinskill Lake, Lake Hopatcong, the South and North Branches of the Raritan River (New Jersey's state record was caught in the South Branch), the Passaic River, Spruce Run Reservoir, Round Valley Reservoir, the Delaware and Raritan Canal and the main body of the Raritan River. (Lots more too, no doubt). Native to Asia, carp are now found on every continent except Antarctica, and throughout the continental United States. Carp live in a wide range of environmental conditions and are found throughout New Jersey. Once considered a nuisance, these giants have generated renewed interest as a game fish. They prefer shallow, warm, well vegetated lakes with mud & silt substrate and can tolerate low oxygen content in the water. As the water temperature drops during the year, they move deeper. In rivers, carp tend toward slow moving areas with soft bottoms, and don't mind cloudy water. Spawning over a prolonged period of time, carp deposit eggs on flooded vegetation. Here's some Trash Talk about "Trash Fishing". While trout and bass anglers will cuss me out, to me a carp is a king and bass and trout take second place by far. They're not really "trash", but clearly, far less worthwhile adversaries. You see, rarely will a trout or bass be big enough to break an angler's line. Hardly ever will one be capable of pulling out more than five feet of drag before stopping to rest. But carp? Hah! A carp is fully capable of cleaning your line completely off the spool and breaking you off at the knot. In fact, I saw that happen the first time I ever fished the Wallkill River fifty years ago! So I will be "Trash Fishing" for bass and trout during this year, for sure. But carp will still be one of my primary targets. Carp are incredibly strong, smart, and big. A ten-pound carp is not at all uncommon, but few among us have even seen, or caught, a ten-pound trout or bass. Contrary to most views, a carp is not a critter that eats trash or spoiled food. That is what catfish eat, among other stuff. Carp eat only fresh food. It could be corn kernels or cooked corn meal balls. English anglers use what they call a "Boilee", but many are caught on maggots (okay, not your food of choice, but at least they have to be alive), or a bit of dough. Some use a floating chunk of bagel or bread, both of which are taken off the surface of the water by carp in a huge inhale. In Spring, many of the carp that I catch are in the Delaware River, and since worms are often washed into the river during high water times, a worm is a natural food then. I caught one last march at Byram that was well in excess of 20 pounds on a baby night crawler. 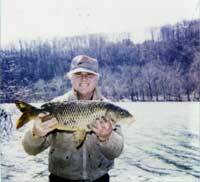 My friend Ron Bern took similar fish in 1999 and 2000 also with worms as bait. Once we get into late April and beyond though, the primary bait is corn kernel. Carp fishing often is improved dramatically by chumming; easy to do while double-anchor fishing from a boat. Just throw stuff upstream periodically and carp will show up for the freebaits. Cooked corn meal works better as chum because it sinks far easier than corn will. British anglers use a slingshot to heave corn or maize or cooked meal far out, but a slingshot is illegal here since some view it as a weapon. The English also use an aluminum pole that has a spoon-like device at one end. Filled with chum, after practice, you can heave freebaits way out with this "throwing stick." "Snap, crackle and pop" are words all of us have heard in connection with the breakfast cereal Rice Krispies. Well, let's hook it up with carp fishing. If you don't fish with your drag wide open, but with your rod placed tightly in a rod holder, the "snap" will take place often if your line is heavy. That "snap" will be the breaking of your rod into two pieces! "Crackle?" Well, with open drag, your line will scream off the spool of your reel, and most carp will take it so fast it will sound something like "crackle" indeed. And the "Pop"? Here again, with tight drag and light line, the "popping" sound will echo across the water as your carp breaks your line without even knowing that someone was trying to hurt him. The author with a beauty. I haven't killed a carp since I started losing my hair, and friends, that is a long time ago. No self-respecting English "Carper" ever kills one either. Therefore, please practice "Catch and Release" with your carp so that they can live to go "Snap, Crackle and Pop" another day. If you would like to become a member of the Carp Anglers Group, an organizations that I belong to, write to Bud Yancey at CAG, Box 69, Groveland, IL 61535 to apply for membership. A newsletter is sent to every member periodically sharing secrets from here and across the sea. Scuze me, gone fishin'! 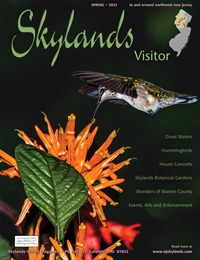 For autographed copies click here.